Halloween is around the corner and I wanted to make some festive brownies that would also be great all year long! I love the combination of peanut butter and chocolate. It’s a classic pairing that you simply can’t go wrong with. Now….add cream cheese to the mix and we have a slight tang that is a great addition to the sweetness and richness of the brownie! This is an easy recipe for a chewy chocolate brownie and creamy peanut butter cream cheese frosting. Enjoy! Preheat oven to 325°. Line a 9×13 pan with foil and coat with cooking spray. 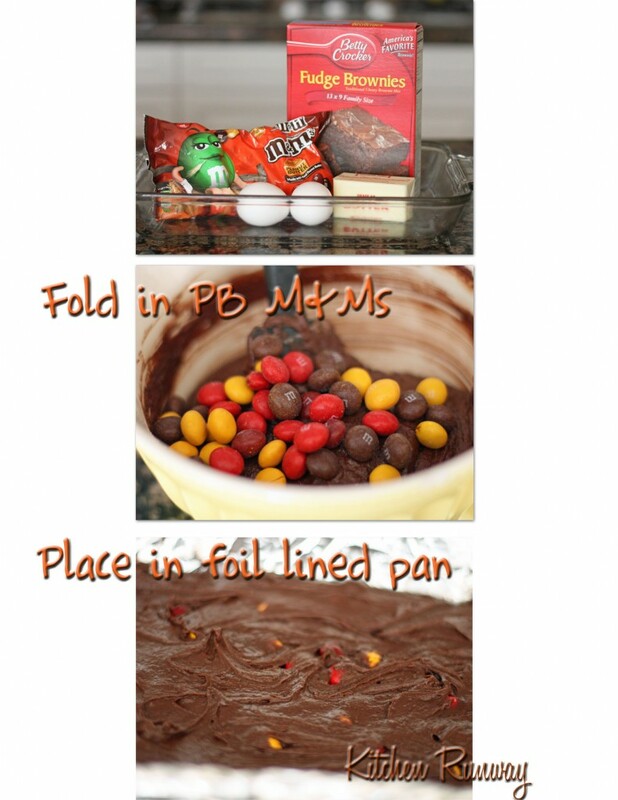 Place content of brownie mix into a medium bowl. Add melted butter and eggs and mix with a spatula until well combined. Fold in peanut butter M&Ms. Pour batter into lined baking pan and bake for 20-25 mins or until done. Place cream cheese and peanut butter into a medium size bowl. Using a hand mixer, mix until smooth and creamy. Add powder sugar and beat until well combined. Frost brownies when completely cooled. Store brownies in a air tight container in the refrigerator. Lift foil from the pan and peel the foil off of the brownies. Place brownies on a cutting board. Using an off set spatula, carefully frost the entire brownie. Using a ghost shaped cookie cutter carefully cut the shape in the brownie. Carefully lift the cookie cutter with the brownie still in the cutter. Gently push the brownie from the back with your fingers to remove the brownie from the front of the cookie cutter. Place brownie onto plate. Use chocolate chips for the eyes and a chocolate jimmy/sprinkle for the mouth. Ta Da – your ghoulish treat is done! (I know the frosting doesn’t exactly make for a typical white ghost…but my reasoning is that these ghosts are from Sunny California – therefore they are a little tan :). Whatever the reason is…they are pretty tasty! 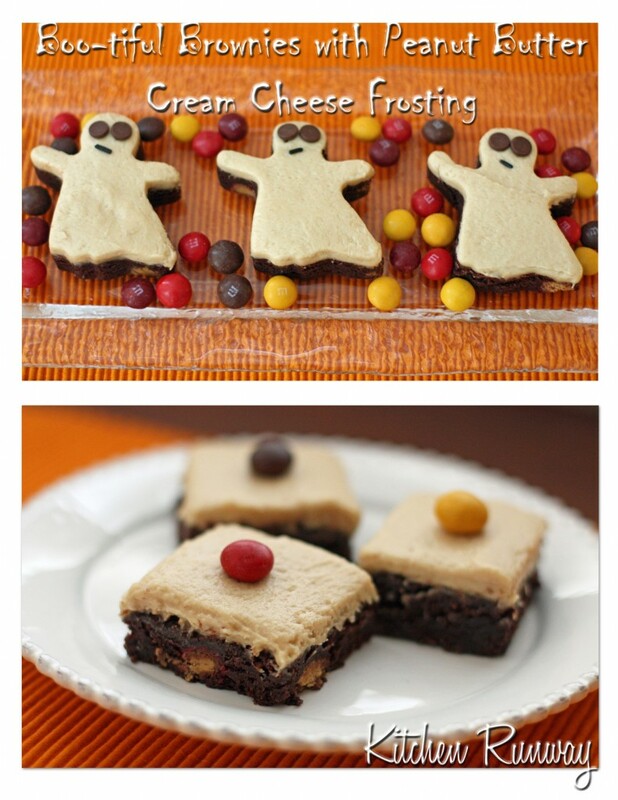 This entry was posted in Desserts, Easy, Halloween and tagged brownies, cream cheese, desserts, Halloween, Peanut Butter. those are adorable… i have had too many treats already and it’s not even halloween yet! man i love cream cheese frosting… did not having any sun last week kill you photography mojo? did mine. Those M&M’s catch my eye everytime I go to Target. What a cute use of them, and they look delicious! Love it! You are clever to trick me into eating a brownie, otherwise I would eat broccoli or something. Louise: Thank you – tell me about it…I think the treats will keep on coming until the New Year!! The weather has definitely made photography difficult! The Duo Dishes: You two are too cute!! Your stick of butter looks about half the size of one of mine, is that 8T? Hi Maria! I’m so excited you’ll be trying it tomorrow! Yes – my stick of butter is 8 Tbs. Take care! !